Toronto’s transit system is taking a beating from all sides this summer. Huge construction projects have prompted annoying diversions all over the damn place — making service that was already suffering from a shortage of vehicles even less reliable. The National Post has been running a series of articles and columns about the system under the colourful banner Streetcarnage. And Mayor Rob Ford continues to tell people streetcars are the major cause of downtown traffic because he sometimes gets stuck behind them while driving. All this has some otherwise reasonable people asking why Toronto even has streetcars in the first place. Aren’t they just an outdated 19th-century technology? Let’s set aside the fact that most of our other transportation modes — subways, automobiles — are also based on 19th-century technology and get right to the point. Any serious advocate for eliminating streetcars from Toronto’s streets would need to prove two things: That replacing streetcars with buses would result in faster transit service, and that the removal of streetcars would benefit other road users. But here’s the problem — even after decades of this tired debate, nobody has been able to prove either. If we isolate the data and compare streetcar routes — all of which run through urbanized areas — with downtown bus routes for a more apples-to-apples comparison, the numbers change. I charted the speeds using downtown bus routes suggested by transit expert Steve Munro in a 2010 article, making a few additions (65 Parliament) and deletions (509 Harbourfront and 510 Spadina south of King, which are both offline due to construction). On those routes, streetcars maintain a faster average speed than buses. The bus average is 12.8 km/h. The streetcar average is 14.2 km/h. It’s not a perfect analysis because averages can shift based on myriad factors along each route, but the data does seem fairly consistent. Some of the bus routes, like 29 Dufferin, benefit in the analysis by being longer routes with less-congested sections, while some streetcar routes benefit from being exclusive right-of-ways that limit interaction with traffic. But even after eliminating streetcar routes that operate in dedicated right-of-ways on Spadina and St. Clair from the data, the streetcar average remains higher. But there are some, I’d guess, who would argue that an overall reduction in speed for transit users would be acceptable because switching to buses would allow motorists to get where they need to go more quickly. But that argument starts to fall apart when we look at the other major benefit of streetcars over buses — capacity. 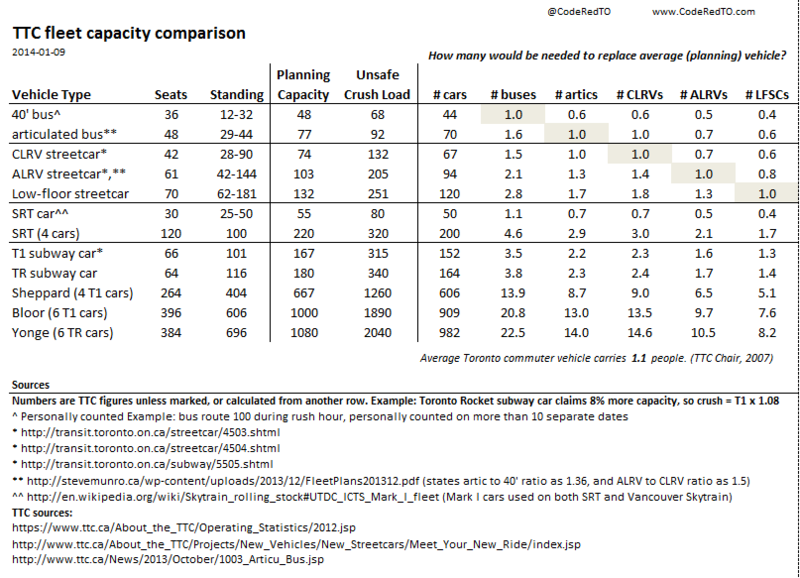 Transit advocacy group CodeRedTO has put together some useful data on the subject of streetcar and bus capacities. The shorter version is that it would take almost three regular-sized TTC buses (2.8 to be exact) or two articulated buses (1.7) to provide the same capacity as one of the new streetcars that will start rolling out across the network later this summer. The TTC has bought 204 new streetcars, so a full bus replacement would mean adding about 571 regular-sized buses or 346 articulated buses to Toronto’s downtown streets. There’s no way to know exactly what traffic would look like with nearly 350 bendy buses serving passengers along busy downtown streets, but I’d bet the situation wouldn’t look much different than it does now. Any potential benefit that comes from switching to buses — including the ability for vehicles to pull over to the side of the road — would be challenged by the number of vehicles required to maintain service. Because here’s the thing, streetcars aren’t the major cause of traffic congestion downtown. It’s the people riding the streetcars. Toronto is congested because a high volume of people are trying to get where they need to be on infrastructure that hasn’t kept up with population growth. Eliminating streetcars won’t change that. Downtown streets would still be jammed with people trying to get to work, regardless of what kind of vehicle they’re riding. Getting rid of streetcars would just mean we’d need to find another scapegoat to blame for our traffic problems.